There are several great reasons to choose our 2 1/2-inch colored eggcrate foam for your next project. Offering an improved sound-deadening performance over thinner wedge foams, eggcrate performs well while saving you money for a solution that meets all your needs. Thanks to the shape with a raised surface, the vibrations of sound are dampened and absorbed at a higher rate than a flat foam. The fact that this is an easy to create foam also helps to keep prices down for an added benefit when choosing foam for your project. 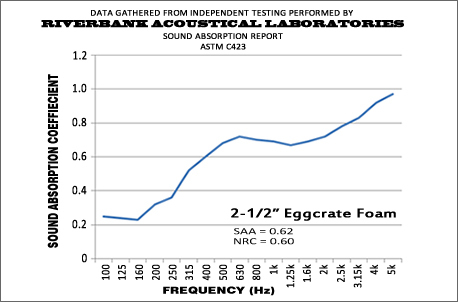 While there are many uses for our eggcrate foam, it is especially well suited to the use of covering dampening foam with acoustical cloth for increased soundproofing performance. We offer our 2 pack 2 1/2-inch colored eggcrate foam in several colors to help you get the option best suited to your needs. With options such as red, blue, purple, yellow, and more, finding the right outcome for your application has never been easier or more versatile. We offer this foam in our standard size of 48" x 72" which is ideal for a wide range of projects and purposes. If you have any questions regarding this or any product we offer, please Contact Us. Standard Size: 48" x 72"